Product ideas, including those on castile soap, are born every day. However, some of them do not get past the concept stage. Many aspiring entrepreneurs are uncertain of how to execute their ideas and use them to make their businesses flourish. If you are facing this issue, you can overcome it by working with an established manufacturer for your products. We are a client based company looking to serve your needs. 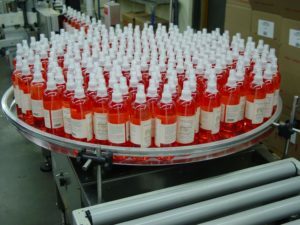 Tropical Products creates high-quality and cost-effective products, such as castile soap and other soaps. We are here to help our clients execute their plans by providing them with superb manufacturing solutions. Our company uses cutting-edge methods to bring ideas from concept to reality for entrepreneurs. From conceptualization and development to manufacturing and packaging, we will help you realize your idea whether it’s on castile soap or other household merchandise. Our company manufactures a variety of household, pet care, and personal care products like castile soap. We have a development team that is ready to listen to your idea for your brand of castile soap. We understand the ever-changing needs of customers, which is why we are constantly looking for ways to improve our methods. Through innovation, we become better at creating goods that appeal to the current market. Contact us to help you manufacture your castile soap, and you can count on great results that are guaranteed by our years of experience in the business. Your customers may be skeptical at first when you introduce your castile soap. First impressions last when it comes to products like castile soap. That’s why quality is important, especially if you are still building your brand. Select an established company that specializes in manufacturing castile soap like Tropical Products. We use high-quality ingredients for our certified organic products and follow the standards set by the United States Department of Agriculture (USDA). This will ensure your customers will get the safest and most effective castile soap. Olive oil, water, and lye are the key components in making castile soap. This product, which originated in Spain, does not contain animal fats and other chemicals found in other types of soaps. It isalso animal and baby safe. It may also contain natural antioxidants, aloe vera gel, and other essential oils. As our client, you will still have the final say on the formulation of your castile soap. We respect your brand’s unique image, which is why we customize castile soap based on your requirements. Our company has all the supplies and resources needed to manufacture castile soap. Choose from our wide variety of available fragrances, including strawberry kiwi, butterscotch, and cucumber melon. You may also pick your preferred color for your castile soap. Take note that the visual aspect of your castile soap can set the tone for your product. Tropical Products go beyond just conceptualizing, developing, and manufacturing great products like castile soap. We can also ship goods to the facilities of Amazon, one of the world’s largest online marketplaces. With this great platform, you can make your castile soap more visible for your customers. It also helps you reduce your expenses by bypassing other distributors. This gives you more time to channel your efforts to the more important things about your business. Aside from castile soap, we can also provide other personal care products. We can help you conceptualize, develop, and manufacture aloe vera gel, bubble baths, conditioners, massage oils, shampoos, feminine washes, facial toners, and more. Are you planning to start a castile soap business? We are here to help you turn your castile soap idea into a reality! Call us today at 1-800-643-7387. You may also check out our website for more information about how we can help you. We look forward to doing business with you. Businesses must define their brand before the market does it for them. To conjure a great business image and simultaneously live up to it, you have to make sure your goods are of incomparable status. Convert your best idea into a reality at Tropical Products! We’re your partner in bringing your vision to life and putting your product on the shelf. Contact us today at 1-800-643-7387. For more information, visit our website. We make business easy in all the right ways.